New purple Power feminized seeds are worth their name, they are much more potent than other purple kinds, all together with a sweet taste New Purple Power is worth the try. 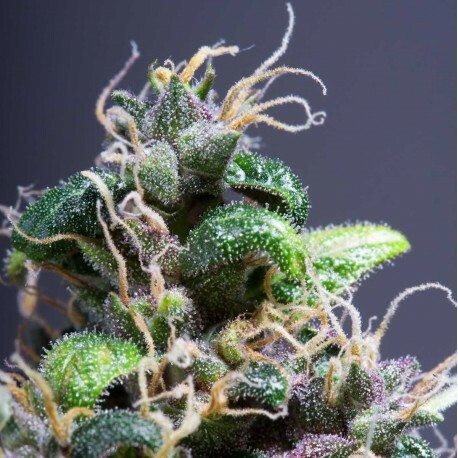 This type of purple cannabis has been developed and became one of the strongest purple kinds available today. Purple kinds used to be popular but in the early days they were sensitive to mold and disease because of their longer flowering stage so outdoor growing always got risky due to bad weather influences. Because of those weaknesses New Purple Powerc was developed, this beautiful lady has a shorter flowering phase and is less sensitive to mold or disease. Also through crossings with Early Skunk and Purple haze the yield has increased and flowering phase has been shortened. New Purple Power is mostly Sativa and grows tall with long fingered leaves and the buds have a blue purple color that intensifies when it's colder outside. Because of the shiny resin covering the buds, the buds have a fluffy look. Consuming New Purple Power gives you an energetic buzz that slowly lingers into feeling lightly stoned without wearing you out. This is a strong cannabis plant, which is 50% Sativa and 50% Indica. These easy-to-grow Purple Afghan seeds have been crossed many times in Holland with Sativa and Indica varieties since 1983. These plants are fully adapted to the climate of Holland and always offer a respectable yield. Right at the beginning of the flowering season, you can see the calyxes on these plants are turning purple. By the end of flowering season, almost 90% of each of these plants turn into purple color and hence the name Purple Power. The weed gives a subtle yetrutted aroma with excellent full body high. During earlier times, these seeds were difficult to cultivate, even though they were popular even in those times for their high yield. The problem with these seeds was that they were very sensitive to diseases and mold due to their long flowering stages. This made them very difficult to grow outside and there always a risk of bad weather influence. These were the reasons why new Purple Power was developed, which now has a very short flowering period and is far less sensitive to diseases and molds. By crossing their older variants with Early Skunk we have managed to increase its yielding power and further decrease its flowering phase. They Taste and Smell Likethe Cinnamon Rolls! The taste of these seeds is very similar to warm cinnamon rolls and its smell is also on the similar lines. It provides moderate THC levels and offers crisp and light cerebral effects that leave you with a feeling of clarity and chill. By medicating on Purple Power you would feel totally relaxed yet on top of your game. The effect lingers for quite some time but doesn’t wear you out. These plants grow quite tall and have long finger shaped leaves and the purple color on the buds intensifies when the climate becomes colder outside. 4 graines sur 5 ont germé et sur celles qui ont germé, 3 poussent correctement. La quatrième rame un peu , elle a beaucoup de retard sur les autres. Je ne sais pas encore si elle va arriver à maturité un jour. I'm growing it indoors. How big should the pot be for each plant? I planed to Place my seeds in a pott, now when I have 5 seeds should I Place eash seed in 5 diffrent potts or al in the same??? How Deep do you recomend to Place the seed? Anyting else youmwant to tell a newbeginer about to make succés! ?